Some 60 travelers from Chrysalis School journeyed this summer to Glacier National Park to participate in a service project that's become a Chrysalis tradition over the past decade-plus. "As I started to set out my clothing into piles of work, hiking and camp clothing I had a chance to reflect back on my previous three trips to Glacier National Park with Chrysalis and what I looked forward to the most in this year my fourth trip," said Jeremy Meyer, a member of the adventure staff at Chrysalis. "There is always the abundance of food to look forward to, but I really think why I keep going back is to see our students growing in a way that is hard to achieve elsewhere. "Trail work physically and mentally challenges teenagers to a level that is hard to replicate outside of service trips such as this. 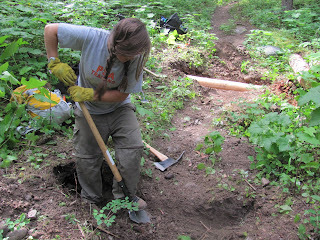 I work year-round with the girls here at Chrysalis and the time that I see most of them make the largest leap in their personal growth of confidence, ego strength and personal strength is when they walk into a work site and see a washed out trail, muddy and murky and three days later see a fifteen or twenty foot turnpike. "The sense of accomplishment is even still great for me after four years. I always seem to walk away amazed as to how much we can get accomplished in just three or four days. But to see the smile of triumph on our students' faces and to come back to campus and see them brighter, happier and walking taller is what the trip to Glacier is truly about to me."